Cambridge Concord KJV Reference Bible is full of practical features that work. This new edition comes in calf split leather which is a higher quality leather than French Morocco, is thicker and about as stiff bu with a less shiny finish. It has a fine pebbly grain that looks like calf-skin. It is very attractive. The binding is Smyth sewn which allows the Bible to lay flat, even at the beginning or end of the Bible. The paper is an opaque India paper, thin, with a slight cream tint, which makes it easier to read for longer periods. There are plenty of cross-references and translation notes in the centre-column which have the verse number on the side of the column that contains the verse, and then the references and notes. The font is around 8-point, clean and easy to read. The red is bold, but not too bold, making it a very readable text. The concordance is has more than most Bibles, making a great study tool. There is a seven page glossary that explains the meaning of words that have either changed meaning or are no longer used since the KJV was first translated. The definition includes the part of speech and a few of the most prominent verses where the word is used and a 128 pages Bible discionary including people, places, objects, information about each book of the Bible, harmony of the Gospels, names and titles of Jesus, chronological tables, quotes and the verses where they are quoted. The Concord has 15 maps, a useful thumb index, two black ribbon markers and, at around 8.25x5.5x1.25, it's still just about a hand-sized Bible fairly easy to hold in one hand and read. 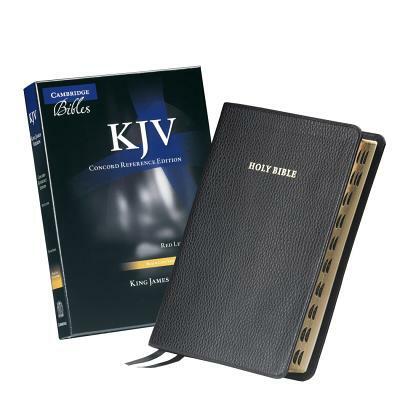 KJV Concord Reference Edition Bible Calfskin Black was published by Cambridge University Press in September 2011 and is our 26759th best seller. The ISBN for KJV Concord Reference Edition Bible Calfskin Black is 9781107602663. Be the first to review KJV Concord Reference Edition Bible Calfskin Black! Got a question? No problem! Just click here to ask us about KJV Concord Reference Edition Bible Calfskin Black. A:'Red Letter' refers to the practise of printing the words of Jesus in red. The idea was first thought of by an Editor in 1899, taking the verse of Luke 22:20 ('This cup is the new testament in my blood, which I shed for you') as his inspiration. In 1899 the red letter New Testament was first published, then two years later a full Bible was first made with Jesus' words in red. Thank you for using the Q&A Forum. The Concord Reference Bible presents the King James Version of the Bible in a clear and readable typeface. This edition offers a wealth of reference material in a real leather binding - a glossary, concordance, dictionary of names and phrases, colour maps and gazetteer. Bold-figure cross-references link passages of the text without cluttering the page. The words of Christ are printed in red. There is a presentation page and family record section. The Bible is printed on India paper with gilt edges and bound with two ribbon markers in attractive calf split leather. This Concord Reference Bible has a thumb index - a traditional reading aid seldom found in modern Bibles.